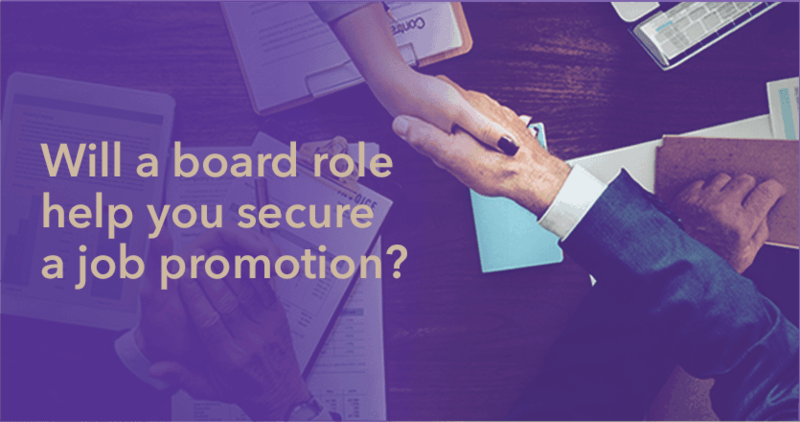 Will a Board Role Help You Secure a Job Promotion? In today’s highly competitive world, most managers operate by the Peter Principle, which follows the observation that individuals are promoted because they are outstanding in their current role, but they have the capability to handle a more senior position. This means that professionals no matter where their career path is, must make decisions that will allow them to showcase their merits beyond routine tasks. A great opportunity to highlight your ability to strategise and look at the bigger picture, in turn resulting in a promotion, is by accepting a coveted board role. Board directors in recent times, are more certain of their knowledge regarding the companies they serve and strategic in their perspective than they were back in 2011, as stated by the latest McKinsey global survey assessing governance. With in-depth understanding of a wide range of subject areas and industry best practices, you may well be on your way to a promotion in no time. Being a board member implies greater responsibility and allows you to showcase leadership qualities in challenging situations, while gaining exposure to cross-cutting organisational issues. Developing your efficiency and performance in terms of community impact and career prospects, is truly possible if you capitalize on the benefits of joining a reputable board. You can apply your expertise in different domains and choose to hone your passions in a way that accelerates your skill development and strategic thinking. While the immediate results will be reflected in the achievements of the organisation concerned, your accomplishments will be noted by important people in your network. Consistently demonstrating high-level leadership in certain focus areas, shall further influence your standing in your current organisation, and accelerate your promotion to a more senior role. While the benefits to be reaped via a solid board position cannot be understated, the important aspect is how to discover opportunities that are well-aligned to your current job description and at organisations that are of interest to you. A great way to begin is by tapping into existing networks and seeing who might be able to lend you support with the search. Express your genuine interest in contributing your strengths in a formal board position and share your resume with significant connections. Organisations take pride in employees that cultivate new capabilities to excel at their existing duties. Securing a job promotion is never easy. You must be aware that your promotion is not only in the hands of your supervisor, but also several representatives in the HR department. Approvals are a process that requires each individual to be equally confident of your skills as the best possible combination for the senior role at hand. To leave them without any doubts, ensure that your expanding responsibilities are visible in the organisation. Ultimately, the choice will boil down to a few moments of recognition and appreciation so spend some time reflecting on how well senior management knows you, and understands your motivations. If you are part of a bigger company, this can often prove to be difficult but take a proactive role in keeping these people engaged. On the day of deliberations for your promotion, the committee should recognise your work as part of a board, and fast-track your long overdue promotion. Be sure to take advantage of casual moments around the office, off-site events and the occasional meeting in the elevator to discuss your meaningful contributions. Stressing on the latest developments in your board role when the timing is right, will only increase your chances of bagging that promotion you are looking for. https://www.directorinstitute.com.au/di/wp-content/uploads/2016/06/icons-di-logo-gold.jpg 400 400 Amber Harrison https://directorinstitute.com.au/di/wp-content/uploads/2016/06/Logos-for-Web-with-Gold-Overlay-white-next-gen.png Amber Harrison2018-07-17 18:50:302018-07-17 20:02:09Will a Board Role Help You Secure a Job Promotion?